Being a seismologist is not just doing research, it is also sharing experience and teaching the next generation. In addition to these actions, a seismologist can also be of help in teaching Earth Sciences and Seismology at school. That’s what we call educational seismology. We provide accessible materials (instruments, lecture notes and practical examples) to guide high school teachers during their Earth Sciences courses. 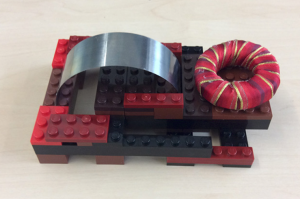 Ever heard of a LEGO seismometer? In the UK, the educational seismology is driven by the British Geological Survey which recently proposed to build a LEGO seismometer (figure 1). If you’re skeptical and wondering whether this instrument could actually detect an earthquake, let’s have a look at the seismic trace (in blue) recorded at the bottom! But what is educational seismology? Educational seismology aims at explaining to students of all ages how seismologists interpret a seismogram and locate an earthquake, the concept of earthquake magnitude, the seismic cycle and the seismic risk, and so on. Another key point of the educational seismology is to provide seismic instruments for teaching purpose [Virieux, 2000; Zollo et al. 2014]. For example, “SISMOS à l’École” in France [Courboulex et al. 2012; Berenguer et al. 2013 and 2014], which celebrated in 2016 its 20th year anniversary, managed to install 75 seismometers in several schools (figure 3). It is a good opportunity for students to see what a seismometer looks like and to observe earthquakes recorded by a seismometer. Moreover, the data recorded by the instruments are useful for the seismic community and available for research purpose on the IRIS database. Figure 3. 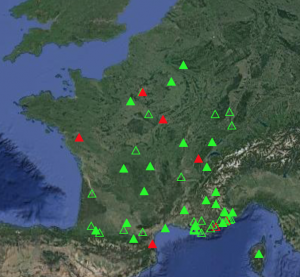 At the top: location of seismic instruments of SISMOS à l’École (http://www.edusismo.org). At the bottom: distribution of seismic stations in France. Green triangles show instruments currently active. Red triangles show inactive instruments. Figure 4. Simulation of a seismic wave generated by the mass motion on a rough surface and recorded by an accelerometer. In the beginning of July, Michelle Salmon from the Australian Seismometers in Schools [Balfour et al. 2014] gave a short workshop at the annual conference of the Australian Science Teacher Association (ASTA) and provided materials for high school teachers. At the end of the session, the small group of 15 teachers left with news ideas for their students and some useful materials for practical purpose (figure 4). 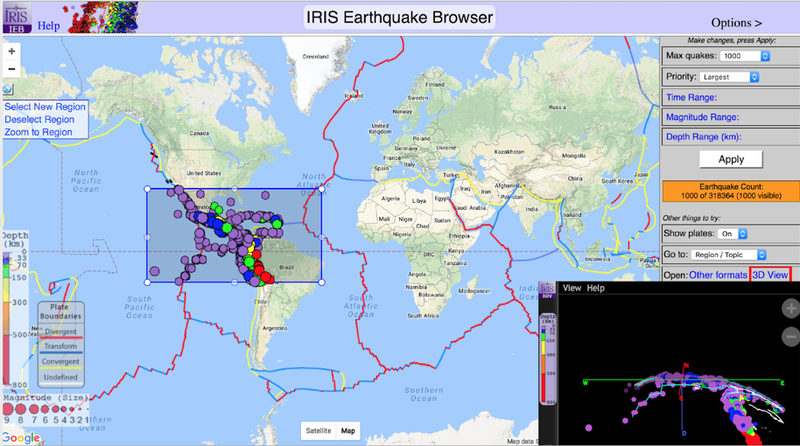 Another useful tool for teaching seismology is the IRIS earthquake browser. From this interface, you can select a list of earthquakes and plot them on a map showing plate boundaries. In addition, you can produce 3D cross section for a selected region and see the distribution in depth of earthquakes located along subduction zones or mid-oceanic ridges (figure 5). Figure 5. Location of earthquakes in Central America. Colour scale shows the depth of these events. At the bottom right, the 3D cross section associated with this region with a domain of mid-oceanic ridge in the western part and the subduction zone beneath the central/South America in the eastern part. Educational resources for high school teachers are available on different websites (IRIS, AuSiS, Edusismo) and free to access. 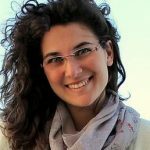 If you are interested to help the community, or you have some ideas and want to teach the next generation, do not hesitate to make contact with one of the members working in the field. Balfour, N.,Salmon, M, Sambridge, M. (2014). 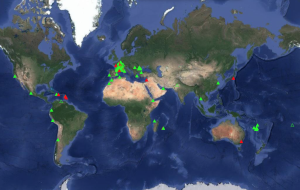 The Australian Seismometers in Schools network: Education outreach, research and monitoring, SRL, 85, 5,1063-1068. Berenguer, J. L. , Courboulex, F., Balestra, J., Nolet, G., Lognonne, P. (2014). Innovative Resources for seismology@school with the French educational seismological network. AGU Fall meeting abstract. Berenguer, J. L., Courboulex, F., Tocheport, A., Bouin, M.P. (2013). 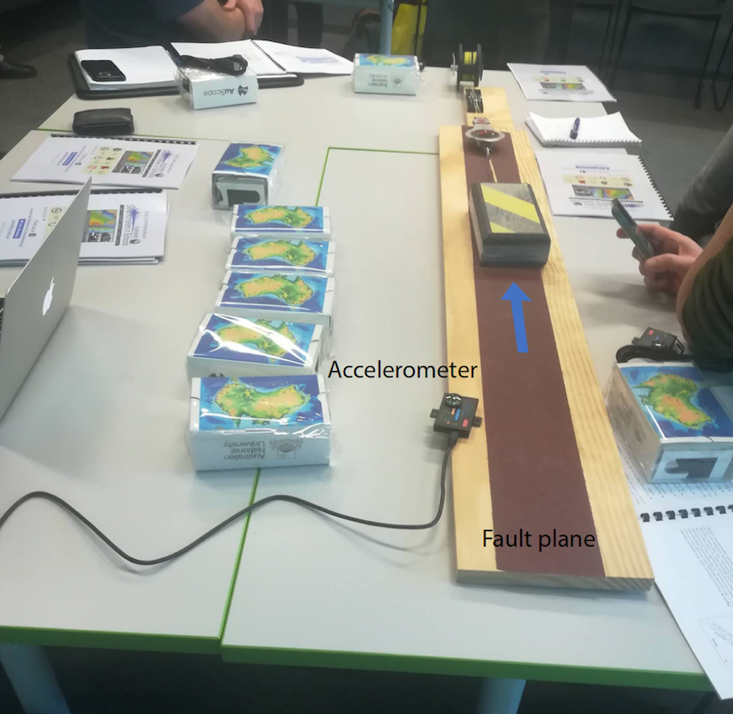 Tuned in to the Earth … from the school Edusismo: The French educational seismological network. Bulletin de la société géologique de France, 184,1-2,183-187. Courboulex, F., Berenguer, J. L., Tocheport A., Bouin, M. P., Calais, E., Esnault Y., Larroque, C., Nolet, G., Virieux, J., Sismos à l’École (2012): A worldwide network of real-time seismometers in Schools, SRL, 83,5, 870-873. Virieux, J. (2000). Educational seismological project : EDUSEIS, SRL, 71, 5, 530-535. Zollo, A., Bobbio, A., Berenguer, J. L., Courboulex, F. Denton, P., Festa, G., Sauron, A., Solarino, S. Haslinger, F., Giardini, D. (2014) The European experience of educational seismology. Geoscience research and outreach, 145-170.